Narrow Waters – 58′ Reverse style cruiser 2015 is a ‘go anywhere’ cruiser stern narrowboat. 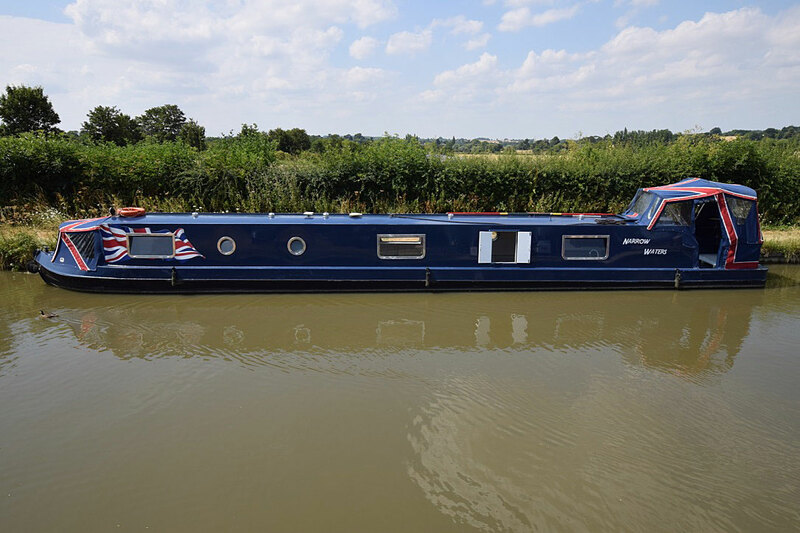 She was built by Pendle Narrowboats on a Bridgeman Hull in 2015 and feels modern and stylish. Her livery is very unusual and apt for both the World Cup and Brexit year – the Union Flag is emblazoned on both sides and the front doors, and the pram hood and cratch cover are the Union colours also. She is a very social boat; the large stern deck seats 5 comfortably around the table, there are 3 double berths and two toilets. A real party boat! The stern deck leads past two floor to ceiling cupboards into the galley, housing the unused double oven, washing machine, 230v fridge (with icebox) and ample storage space. The dinette (with side hatch) follows. This has storage under and turns into a double berth, as does the large couch in the saloon. The water tank is under this couch. The walk through shower room is next. The glass mosaic-tiled quadrant shower is opposite the circular ceramic basin and Thetford cassette loo, and the two towel rails will keep this room toasty in the winter! A short corridor on the port side leads into another toilet room with cassette loo and another ceramic basin. The main bedroom is in the bows; the bed is a cross bed with storage under and sits next to a huge double wardrobe. The doors lead onto the well deck. She is centrally heated by under floor heating as well as the radiators and towel rails. Hot water is provided by the Webasto, engine or immersion. Lighting is all LED (including under-gunwale mood lighting thoughout), and on board power is from either landline or the 2kw inverter. Wiring is in place for solar panels, there is a TV point in the saloon cupboard with Sky cable, there is a docking station built in for music and there is a 4G aerial & router. She is propelled by the recently serviced Canaline 42 (with only 604 hours on the clock). A striking head-turner of a boat, she is ready to go and would make a lovely home or holiday boat.